Ride With Us was founded in 2014 by the union of Daniele Pernigotti’s sensitivity on Climate Change and Claudio Bonato’s passion for cycling. The idea is to make “riding with us” a large number of people to emphasize the importance of a rapid and radical action on man-made climate change. 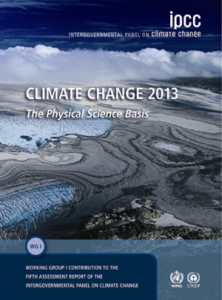 This is the reason why we organized several evening meetings along the way, participating in conferences, meetings, debates with local figures of reference in the field of climate change. The first year we rode from Venice to Copenaghen to highlight the connection between Climate Change and Science. 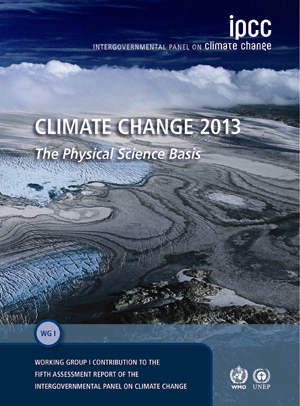 In fact, we reached the Danish capital on the occasion of the presentation of the 5AR IPCC Synthesis Report, the document that represents the state of the art of the scientific knowledge on climate change. 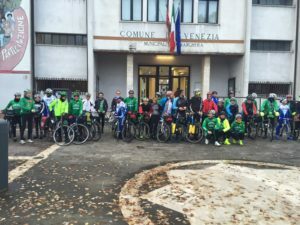 In 2015 our friends of Pedale Veneziano, an historical cycling association from the Venice Lagoon, that has recently turned 100 years old, joined us. 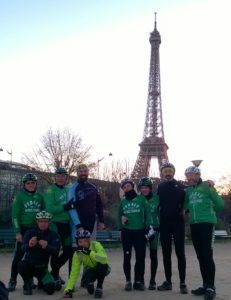 We decided to cross the Alps in late autumn to ride from Venice to Paris, on the occasion of COP21, emphasizing the link between Climate Change and Politics. 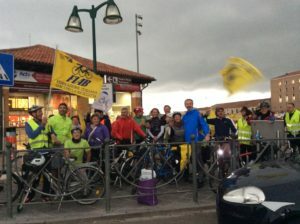 In 2016 the group grew further with the important membership of FIAB Mestre, a local branch of the national association that promotes the use of bicycles in different forms. 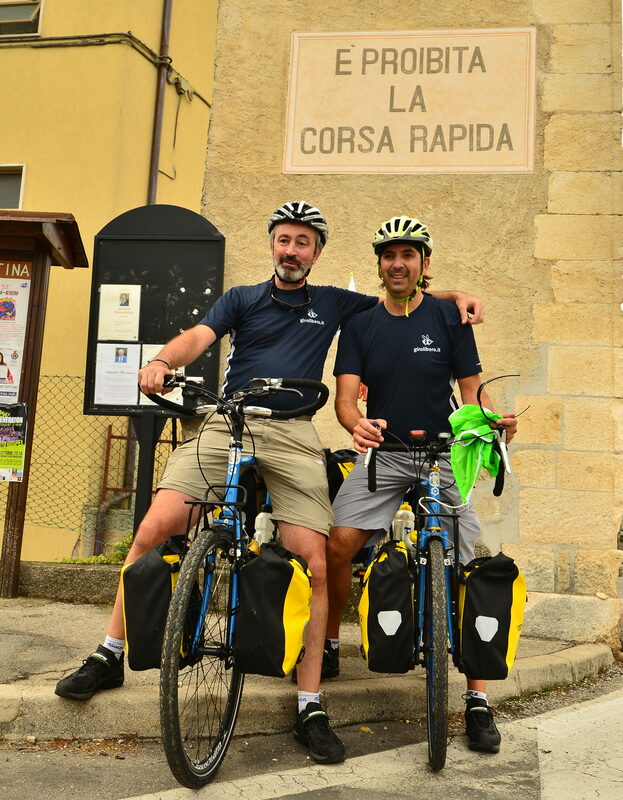 The aim was to highlight the link between Climate Change and Health and so we rode from Venice to Turin, ending our trip at the Regina Margherita Hospital, where the final event with the partecipation of Luca Mercalli took place. In 2017 the group was more solid and numerous, requiring the establishment of an organising committee for the event! At the starting in Venice, the group was made up of about 50 people and almost half of them reached Bonn where COP23 took place. FIAB Mestre and Pedale Veneziano took part in the organisation and many other association supported us (Legambiente, Bird Life International, LIPU, Kyoto club etc.) including the Italian Ministry of Environment. 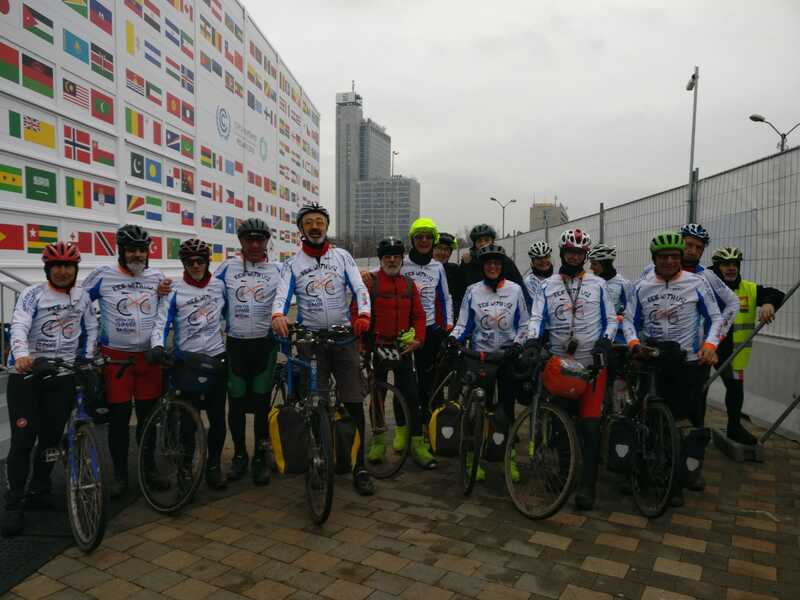 In 2018, we decided to ride from Venice to Katowice on the occasion of COP24, where the so-called Climate Change Package was signed for implementing the landmarks Paris Agreement on climate change. During our way to Katowice we had to face the frigid weather and some misadventures, however the cohesion of the even more numerous group helped us to reach the destination. 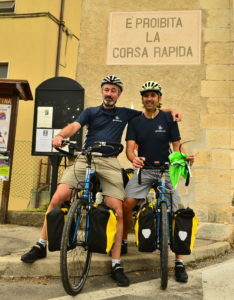 This year we will ride from Venice to Brussels for the election of the European Parliament.